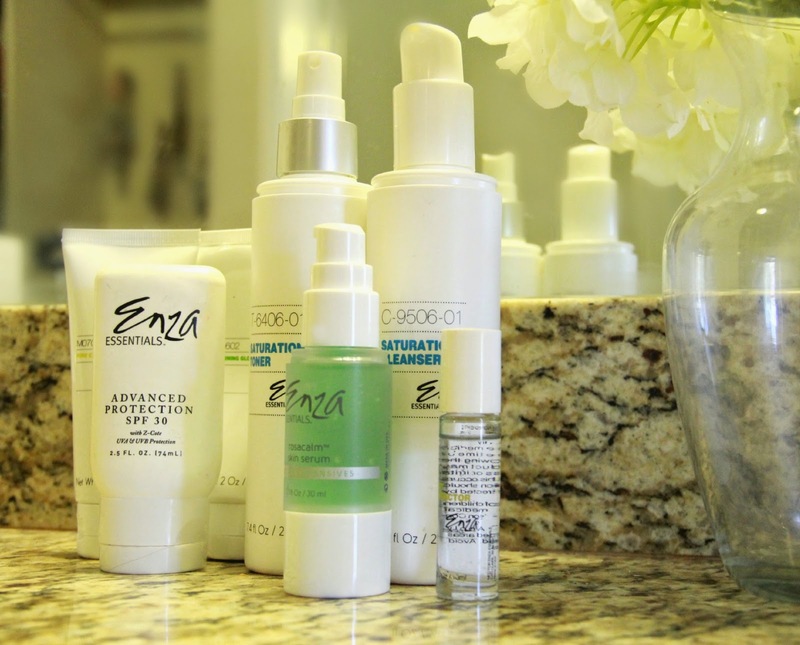 You guys, this post has been a long time coming and I am thrilled to finally share my experience using Enza Essentials! I received my products a couple months ago, and didn’t really know what to expect. I was pleasantly surprised when I opened the package and a saw a folder with my day and night skin care regimen all printed out, specifically for my skin type. Not to mention, they added a dark chocolate cookie crunch candy bar. Id say they just love me, but really they do this for all of their customers. 🙂 The first day I used it, I had just taken a shower and decided to try it out. I just finished washing my face when the doorbell rang. I walked through the living room, and the first thing my husband said when he saw me was, “wow honey! Your skin looks amazing!” Now, this was a shock to me because I had just gotten out of the shower. I have really uneven skin tone, especially right after I take a shower. I looked in the mirror and couldn’t believe what I was seeing. Radiant skin, with little to no redness! I was ecstatic! I thought it must be too good to be true, especially since I felt and saw a difference so quickly. Two months later, and I cannot live without it. My little boy Beckham lost my cleanser, and my skin was not happy with me about it. I wrote Enza an email, and they quick shipped me a replacement. I had it within two days, and literally ran to my bathroom to wash my face. Since then, I have had a few people ask me, “do you still love Enza?” Well, the answer is YES!!! My skin feels soft, vibrant, and if this makes any sense, it feels like it can just “breathe!” If you are interested in ordering, you can go to Enza Essentials and use code KISSMEDARLING to get an extra 40% off your purchase! Now, if you are wondering what my skin care routine is and what products I use, then keep reading. They sent me the Complete Saturation System and added the Rosacalm serum, advanced protection, spot extractor, pore extraction masque, vitamin E, and sustaining glow cream. My Morning Routine: I like to wash my face first thing in the morning as long as my kids allow it. I use the saturation cleanser first. I put it on, rinse, and then repeat. The first rinse takes off all of the surface pollutants, and the second rinse gives my skin a deeper cleanse. I then use the saturation toner. I just spray a little bit on a cotton pad, and tab it on my face. Afterwards I use the sustaining glow cream, vitamin E, and of course the SPF advanced protection. Can I just say how much I love the glow cream? The name fits it perfectly, because my skin is glowing afterwards! My Night Time Routine: At night, I use the same routine with the cleanser and toner. I put the rosacalm serum on my problem areas for uneven skin tone. After time, this has helped my skin tremendously. Once a week I use the pore extraction masque and Saturation Aloe Scrub. Every time I use the scrub, I have at least three people tell me how beautiful my skin is! Plus, my makeup always goes on so smoothly afterwards. I also use the spot extractor pretty much whenever I feel like I need it. I don’t have a lot of dark spots, but any I have noticed have been significantly lightened using this product. I hope this helps anyone who is thinking about trying this product. I for one have loved using it, and will continue to use it until I find something I like better. I don’t see that happening any time soon. 😉 Thanks for reading! Next Post A Very Special Birthday Giveaway!! !